Library image #2890: Temperate Rainforest on Prince of Wales Island. The United States Congress designated the Maurelle Islands Wilderness (map) in 1980 and it now has a total of 4,814 acres. All of this wilderness is located in Alaska and is managed by the Forest Service. The Maurelle Islands, a group of nearly 30 dots of land rising less than 400 feet above the waves at their highest point, are best known for the abundance of marine mammals that populate their waters: humpback whales; sea otters; Steller's sea lions; and seals. Windswept beaches occasionally break the rocky shoreline. Tall stands of Sitka spruce and western hemlock, often tortured by the wind, thickly cover most of the islands. Numerous rocky shoals make boating around the Maurelles potentially dangerous, but the sea kayaking can be worth the risk. Black bears, black-tailed deer, and wolves inhabit the larger islands in limited numbers. Seabirds and bald eagles are commonly seen. 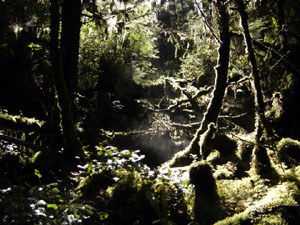 The Maurelle Wilderness has an historic use of subsistence, generally by native peoples from Klawock and the western shore of Prince of Wales Island. It is also a stopover for fishing vessels as a protected anchorage. Motorized boats and small floatplanes are permitted to land, and camping is allowed. Strong winds and rain can delay pickups for those who have been dropped off, and make campfires difficult to start and maintain. There are no developed facilities or trails in the Maurelle Islands Wilderness, but lots of opportunities for exploration. Planning to Visit the Maurelle Islands Wilderness? How to follow the seven standard Leave No Trace principles differs in different parts of the country (desert vs. Rocky Mountains). Click on any of the principles listed below to learn more about how they apply in the Maurelle Islands Wilderness.